If there was one person more than any other who personified what made my experience of Pomona extraordinary, it was Professor Martha Andresen. The brilliance of her intellect was matched by the openness of her heart, and she instilled in me a love of literature that remains alive after more than three decades. I know that I am far from unique in that regard; a number of my classmates who have gone into teaching have spoken of drawing on her example years later. She challenged her students in the best possible way, confronting the flaws and unexamined assumptions in our thinking not to make us feel inferior but to push us to become the better readers, writers and thinkers she believed we could be. I had the great good fortune of continuing a friendship with Professor Andresen long after I had graduated, corresponding about our lives, art, politics, and most of all writing. We would discuss the books we had recommended to each other, explicating what a particular writer had achieved or failed to achieve. This was never dull academic pontificating, at least on her end; everything she wrote burned with her love of the written word. I have kept every one of those letters from her, and I cherish them. Pomona will of course go on, with other talented and dedicated professors to lead it into the future, but it will never be the same. Martha Andresen will never be replaced. Thanks to Char Miller for his review of the natural systems that have shaped Los Angeles (“The Wilds of L.A.,” PCM Spring 2018). But I think he’s misreading the city when he calls it “concretized and controlled” and claims that it’s “nearly impossible to locate nature” in Los Angeles, except in the earthquakes, fires and floods that he describes in almost apocalyptic tones. In contrast to many large cities, wildlife and nature are a wonderful, unavoidable part of everyday life in Los Angeles. At our home just two miles north of Downtown L.A., we are frequently visited by coyotes, bobcats, possums, raccoons, skunks and snakes. Birds of prey like red-tailed hawks and screech owls share the trees with woodpeckers, finches, warblers and hummingbirds. I was especially chagrined that Prof. Miller dismisses the Los Angeles River as an “inverted freeway.” The channelized River is indeed a concrete ditch for much of its 52-mile run, but it is also a habitat for much wildlife, especially in the three “soft-bottom” sections of the river (the Sepulveda Basin, the Glendale Narrows, and the Long Beach Estuary). I recently published a novel set on the L.A. River (The Ballad of Huck & Miguel), and the fugitives in the book encounter many of the same animals that I’ve encountered down there, including herons, egrets, turtles, fish and snakes. What’s more, millions of LA residents live less than an hour away from mountain waterfalls, desert oases and ocean tide pools. For nature lovers who also want access to the cultural diversity (and economic opportunity) of a major urban metropolis, there is no better place to be than Los Angeles. As a longtime “Rural Voice” from Beaver Dam, Wis., I was especially interested in Mark Wood’s piece on Rachel Monroe ’06 and Marfa, Texas, because I had just been reading Possibilities by Patricia Vigderman. In the chapter “Sebald in Starbucks” she writes about sitting in Starbucks in Marfa and reading W. G. Sebald’s Austerlitz. She explains how Marfa got its name: In 1881, a Russian woman came with her husband, a railroad overseer, to an unnamed whistle stop. She was reading a novel published the previous year, The Brothers Karamazov, in which Dostoevsky gave the name Marfa to the Karamazov family servant—and the unnamed town in Texas got its name. The essay is delightful, as is the book by Vigderman. Thank you, PCM, for publishing news of the passing of former Pomona College Assistant Professor of History John Dwyer. He served at Pomona for only a few years, but the quality of that service was unmatched in my experience. I remain grateful beyond words for his friendship and guidance, for his love of history and Africa and for his wonderful family. Saturday mornings will always bring memories of the Metropolitan Opera broadcast, accompanied by a proper pot of tea. Thank you, Mr. Dwyer, for everything. Okay, maybe the good part of being a children’s author is that Mac Barnett’s (’04) kid audience doesn’t “fanboy” over him…but the adults reading his books definitely do! I was so psyched to open the Spring 2018 issue to “Ideas That Feel Alive.” We are HUGE fans of his work in our family, and we read one of his books with our 2½-year-old Lyra almost every day. We particularly love his collaborations with illustrator Jon Klassen—Extra Yarn and The Wolf, The Duck & The Mouse are our most beloved favorites. We’d actually just bought Triangle for Greg Conroy’s (Pomona ‘00) son Malcolm’s third birthday on the same day the PCM arrived in the mail! It’s super refreshing to read kids’ books that are quirky and smart: Barnett doesn’t talk down to kids or dumb down his stories, even when they’re a little dark or offbeat (in the best way possible). We can’t wait to keep reading everything he writes! 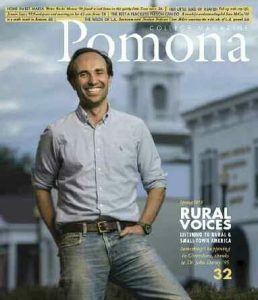 Pomona College Magazine continues to be readable, relevant and enlightening, thanks to your creativity and hard work. We look forward to each issue and read it cover to cover. Alumni, parents and friends are invited to email letters to pcm@pomona.edu or “snail-mail” them to Pomona College Magazine, 550 North College Ave., Claremont, CA 91711. Letters may be edited for length, style and clarity.